Herbivores—not herbicides—is the way to go, according to research published in the journal PeerJ. The researchers compared the effectiveness of goats versus chemical herbicides against the common reed—a grass that is overrunning coastal wetlands from New England to the Southeast. "For more than two decades, we've declared major chemical and physical warfare on this grass, using all the latest man-made weapons," says Brian R. Silliman, PhD, associate professor of marine conservation biology at Duke's Nicholas School of the Environment. "We've used helicopters to spray it with herbicides and bulldozers to remove its roots. More often than not, however, it returns." So, they were excited when goats—cheap, environmentally-sustainable goats—proved to be an effective solution. "We find that allowing controlled grazing by goats or other livestock in severely affected marshes can reduce the stem density of [reed] cover by about half in around three weeks," Silliman explains. Not only are goats less toxic (obviously), but they're also much more affordable than chemical sprays. Separate studies also showed that horses and cows are also effective against this invasive grass. Silliman points out that everyone (well, except the chemical companies) wins with this solution: The marshes aren't polluted with toxins, the farmers get a new source of income by renting out their livestock (and the goats get a free meal), and the land managers get a cheap fix for the issue. Plus, with a cheap, effective, and safe solution, the problems caused by the grasses can be solved quickly, allowing everyone to enjoy the beautiful beach views again. 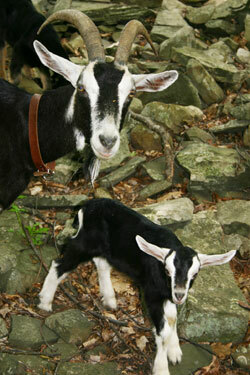 Hi Susun, many people know of you as an herbalist and author, but you also keep dairy goats. Can you tell me a bit about your herd? I have kept a herd of Alpine milk goats since 1976. Saanans and Toggenbergs are Alpine goats, but I keep Alpine Alpines, the ones with the little black skirts. They are light on their front half and dark on the back half, with dark markings on the face. I keep does who have wattles and beards, and I don’t dehorn, so my girls are quite striking looking. I think of them as the essence of goat. I started out with the best purebred goats I could afford. And I’ve always done my best to maintain exceptional bloodlines in my herd, even though I don’t register or show. When it’s breeding time, distance and cost are not my deciding factors. I will pay more and travel further to get a buck from a milky line. I also breed for a gentle personality. There are so many visitors to the Wise Woman Center that I can’t keep problem animals. The closest bucks to me are those at a farm that raises meat goats. My goats don’t go into heat until November, and sometimes not until January, because I don’t keep a buck. Those winter months are harsh weather months where I live. So occasionally I have done the easy thing and gone to the meat bucks, but we’ve always eaten those kids, they don’t become part of my herd. Recently two neighbors have gotten into goats and are keeping good Alpine bucks, so my days of driving two hours away in below freezing weather for good bloodlines are over. I’m relieved. I had read that you consider goat milk your favorite herb, high praise indeed! My goats are not on fenced pasture, but are allowed to roam. They eat an enormous variety of medicinal herbs, such as rose leaves, raspberry leaves, goldenrod, burdock, plantain seeds, wild mustards, and onion grass. When I began my goat journey, I went out with my goats and a notebook every day and kept a record of what they ate. I came to appreciate that the goats would wait until a certain time in a plant’s life before they’d eat it. Sometimes I would think they didn’t like a plant, and then later, when it had matured, they would eat it. 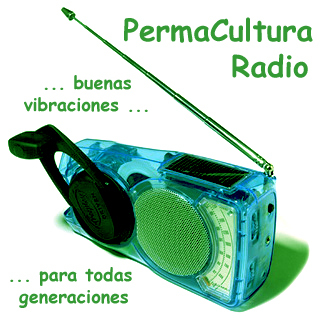 They taught me to be aware that plants are not the same every day, that their constituents change with the seasons. So not only is goats’ milk herbal medicine, the goats themselves are teachers of herbal medicine. While visiting my daughter, who was working in Switzerland, I went to a tourist show on cheese making. When I make cheese, I heat my milk to 90 degrees (hot enough to give me a hard, slicing cheese without the bother of aging it), then rennet it and wait while it sets up. At the show, we were shown a film about Swiss cheeses during the time it took the rennet to curdle the milk. The special savor of Swiss cheeses, we were told, comes from the special plants that Swiss cows eat. On the screen flashed some of my goats’ favorite plants: dandelion, red clover, yellow dock, yarrow, plantain, and chickweed. Yes indeed, milk from free-range animals is herbal medicine. That makes me wonder since cows are grazers and goats are browsers, does that make cows’ milk different from goats’ milk in a quantitative way? 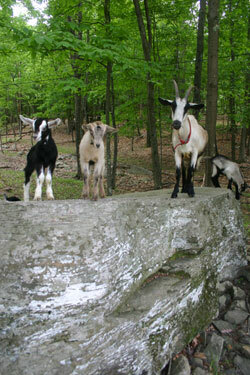 Browsers, like goats, eat mineral-rich tree leaves in addition to herbs. So goats’ milk has more minerals than cows’ milk. Goats’ milk is also higher in vitamin A. Goats are exceptionally good at converting the carotenes in plants to vitamin A; cows are not. This makes goats’ milk chalky white and rich in vitamin A, while cows’ milk has a yellow tinge, especially noticeable in the cream, and is low in vitamin A. But the biggest difference between goats’ milk and cows’ milk is the size of the fat molecules, which is independent of what they eat. The small fat molecules in the goats’ milk make it easier on most people’s digestive systems. We have supplied several dairy farmers with goats’ milk when their children or grandchildren were unable to handle cows’ milk. I think goats’ milk actually tastes better than cows’ milk. Only if you keep a buck! That is one secret to really great-tasting goat milk: No bucks. The other secret is strict attention to hygiene. We strain and refrigerate our milk immediately after milking. All of the equipment we use – jars, pans, strainers, lids, everything – is dedicated to dairy and used for nothing else. The cheese pot is only for cheese. The yogurt pot and jars are only for yogurt. We are especially careful rinse all our dairy equipment in cold water before washing it in hot water. My friends, who kept a large herd of goats on a farm north of San Francisco, were the focus of an article written by a reporter couldn’t get over the fact that they were running the whole farm without men. She decided they must hate men. “They hate men so much that they keep their male goat in a separate barn and have special clothing they wear when they’re around him,” she wrote. Their rank smell is a combination of peeing on their own faces and an oily attar that they produce. These pungent odors permeate the clothes, skin, and hair of those who handle the bucks. And the skin, hair, and milk of any does that live with them. If you don’t wear special clothes when you take care of your buck, you’re going to get funny looks at the post office! How many goats are you keeping now? Sieben Ziegen, seven goats. There’s a wonderful German fairy tale that starts “Under a mountain seven goats lived . . .” So I always feel I am in a fairy tale when I have seven goats. We currently milk six goats, though our oldest, who is fourteen, gives only a token amount. One doe was born this year, two freshened this year, one freshened last year, and two freshened three years ago. Now, in October, we are still bringing in close to three gallons of milk a day. And with that milk you’re making cheese and yogurt and drinking it straight? Yes. We make two gallons of yogurt a week, and two or three large five-pound cheeses. I don’t drink much milk, actually, but my sweetheart does. And we make puddings, “cream of” soups, and a variety of vegetable dishes based on milk, too. We make goat cheese lasagna or macaroni and goat cheese at least once a month.. I generally breed two goats each year and milk them though – summer and winter – for three years before re-breeding. This keeps my herd small so I can take excellent care of them. 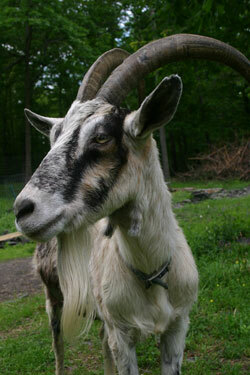 Juliette de Bairacli Levy influenced me to reject all inoculations, chemicals, and other modern medicines for my goats. I keep them in top-notch health with simple herbal remedies. And I would love to talk to you about that. How do you handle the worming? Since my goats browse on more than fifty acres of forest and clearings, they don’t have the worm problems found in pastured animals, where parasite eggs are constantly excreted and ingested. My goats have access to several large patches of Artemisia vulgaris, a weedy relative of wormwood. We call it cronewort. They eat it avidly, and it seems to keep them in a healthy relationship with their worms. I monitor their worm load by sensory clues. Milk from a wormy goat doesn’t taste as sweet and delicious as milk from a healthy goat. And a wormy goat has a off smell that is really noticeable when you milk by hand, as I do. I used to rely on the texture of the goat droppings to alert me to worm problems. When worms proliferate, the droppings look more like cow pies and less like little goat raisins. Since the ladies started drinking my excess whey, however, they often have clumpy droppings, so that signal is not so useful to me. When I see signs of worms, I’ll offer the goats dried flowering cronewort (also known as mugwort). I also offer them dried flowering cronewort after kidding. We are harvesting it now, late in the year, when the flowers and seeds are rich with oils. What we don’t use for the goats we’ll use for dream pillows and smudging. What other medicinal herbs do you keep in the barn? Good hay is medicine for the goats. Rough, coarse, thorny, seedy hay is a favorite with goats. Moldy, dusty, fine hay is not suitable. We get the hay that’s cut on the edges of the hay fields, not the horse hay. I occasionally feed a little red clover, but never alfalfa. On the shelf with the scale I have several bottles of herbal tinctures.There’s a bottle of shepherd’s purse tincture (Capsella bursa-pastoris) in the barn. A dropperful directly in the goat’s mouth will stop postpartum bleeding. My goats have uneventful labors and generally kid easily. I’ve had to pull a kid only once in thirty-four years. That was an awful mess. I grabbed the wrong feet and got the two kids really tangled up in the birth canal. I wound up going to the vet for help. The vet, like I, thought the kid whose head was out was dead; but we were both wrong. The doe and both kids survived. The vet gave the doe a shot of antibiotics and a shot of the strong uterine-contractor (pitocin) to close her uterus down after the trauma. Two hours later she was in excruciating pain from the pitocin; she was bent into a “u” and making that moaning sound that no goat owner ever wants to hear. To relieve her pain, I gave her four or five dropperfuls of St. Joan’s/John’s wort tincture (Hypericum perforatum), again right in her mouth. She was pain-free in fifteen minutes. I don’t keep that tincture in the barn, though; I keep it in the house because I use it so often! I used to feed my goats apple cider vinegar and dried raspberry leaves to help them kid easily. But I find the biggest aid to easy kidding is a big doe who is well fed, so I don’t find I need those aids anymore. I also used to feed the goats delicious granular kelp which they loved to eat. It made their coats really shiny. But I can’t get that kind anymore and the kind I tried was too fishy-smelling for them. There’s a big bottle of echinacea root tincture (Echinacea augustifolia) in the barn. (I make it by the quart.) And a smaller one of poke root tincture (Phytolacca americana). My goats rarely get mastitis, but anyone who keeps dairy animals knows it can happen suddenly, so I prefer to be prepared. Poke root tincture is a specific against breast infections. Echinacea is a superb antibacterial and immune system nourisher. I add one dropperful of poke tincture to an ounce of echinacea tincture. The dosage for a full-grown goat is about six dropperfuls of the echinacea-poke mixture. In the most severe cases, we will dose on an hourly basis. As the mastitis recedes, we lengthen the time between doses. I have found even difficult cases of mastitis will bow to frequent, large doses of echinacea. The worst mastitis I ever dealt with was caused by acorns. Our star producer – we had to milk her three times a day or she would leak milk – gorged herself on fallen acorns. We didn’t realize how many acorns she had eaten until milking time. She was down and her udder was the size of a beach ball. We gave her eight droppers of echinacea/poke every half-hour, and poulticed her udder with warm, boiled cabbage leaves almost continually throughout the night. By dawn, we could milk her, though we continued to give her echinacea/poke every two hours for a few days. The last remedies in the barn are drugstore items: the pink bottle and the blue bottle. When my local vet stopped seeing large animals, he presented me a bottle of Pepto-Bismol and a bottle of Milk of Magnesia. He maintained there’s very little that can go wrong with a goat that one or the other won’t fix. And he wished me good luck. Goats do occasionally eat poisonous plants. And either the blue bottle or the pink bottle will generally work. One afternoon, out in the woods, the goats ateVeratrum viridis, known as Indian poke or false hellebore, which is a cardiac poison. The next day I thought they might be dying. They couldn’t stand up, they were throwing up and their eyes were rolling around. I poured the pink stuff into each goat and they did all survive it. Now, whenever they are in that area of the woods, and catch sight of the tall green Indian poke plants, one of them snorts and they all run away. Goats have very good memories. At my previous place, the goats would eat mountain laurel every spring. I thought they probably got high from it; they certainly acted as though they did. They would only eat enough to get a little sick, not enough to kill them. What time do you milk? We generally milk at nine in the morning and nine at night. I am not an early riser. Sometimes, due to my teaching schedule, I have had to milk at noon and midnight. Any twelve-hour schedule seems to be fine with the goats so long as you stick to it. It’s a huge time commitment to keep goats the way you do without fences. You’re absolutely right. And it’s certainly worth the investment of time and energy. It takes me outside on days when I might just sit inside. It keeps me active and fit. Herding goats is great for my health and the goats’ health. I do have the advantage of having apprentices to help herd the goats during the summer. It costs me about hundred dollars a day to keep the goats, if I count payment for herding, milking, mucking the barn, and cheese making, as well as direct expenses such as hay, feed, barn repairs (a constant with goats), and breeding fees. That’s why you can never sell the milk, because you’d have to sell it for so much money. Of course, I don’t get paid for the time I spend with the goats, so it isn’t nearly so expensive in terms of cash. If I had to go out and buy the amount of goat dairy I currently eat, I would spend as much and miss out on the relationships with goats. Getting started need not be costly either. Goats need real shelter from the weather. A tight shed with no drafts and good light is vital to their health. It can be small; it can be rough. My milking parlor is built right on the rocks, without need of a floor. The goats’ stalls are floored. We allow a deep bed of hay and droppings to accumulate over the winter to help keep them warm. What else are the goats eating besides what they’re browsing? We give them sweet feed, a horse feed. It is the lowest protein feed I have been able to find. Pushing high protein on goats seems to cause health problems. We give them a cup of sweet feed for each pound of milk they give. Our maximum is three cups per feeding, no matter how much milk they are giving. My goats are exceptionally long lived, most live until twelve or thirteen, some until fourteen or fifteen. I think that’s because of their low protein diet, because they aren’t bred every year, because I don’t breed them until they are at least a year and a half old, and because I let the doe kids suckle for as long as they like. Kids stay with their mothers at night in her stall and go with the herd all day, nursing freely. After six weeks, they are locked out of mom’s stall from the time they are put away (about 5 PM) until milking time at nine, but allowed back in with mom after we milk, and free to nurse all night. We lock the kids out of mom’s stall completely when they are between ten and twelve weeks old and start giving them tiny amounts of sweet feed. They still get to nurse during the day, and some continue nursing for years, even after they, themselves, have kidded! Have you been able to find an organic horse feed? No and it doesn’t matter that much to me because they are eating such small amounts. While I prefer organic, and while I support organic, I am not hung up on organic. I prefer Juliette de Bairacli Levy’s term: Natural Rearing. I have a homestead, not a farm. What’s the difference? Homesteaders don’t grow hay or grain for their animals; farmers do. I buy local hay – from my two neighbor farmers who now keep goats. Neither of their farms is certified organic; neither of them would ever bother to use chemicals on their hay fields. That’s good enough for me. That’s natural. My goats are always supplied with red salt licks. Each goat has her own salt block. It is another essential in keeping goats healthy. It’s as important as providing them with plenty of water. What do you for vaccinations Susun? I don’t vaccinate at all. My herd is a closed herd. There are some pretty nasty goat diseases around that can be tricky to get rid of once you introduce them onto your land. But I’ve never had to deal with them because other goats don’t come here and we don’t leave our does when we breed them. We stand there until we are satisfied she’s been covered and then we take her home. And you haven’t had a problem with tetanus? No. Tetanus lives in soil and I live on an old bluestone quarry. My land is solid rock and broken rock, but very little soil, so little tetanus. Plus, tetanus is an organism that grows in closed wounds. I can’t remember the last time any of my goats had a wound. And if they did, I would use yarrow tincture to disinfect it, and I would not stitch it closed, so tetanus would be unable to grow. We are extremely careful not to touch the umbilical area of the kids until they are two weeks old. One of the benefits of living on such rocky land is that I don’t have to do much hoof trimming. Some of my goats can go two or three years without needing a trim. At the two other places I kept goats, it seemed like I had to tend to their hooves every month or so. Continue reading on main page of this Animals chapter: "On Giving Death"
These are the plants I have observed as favored by goats. I am sure there are dozens more species that are useful in raising goats.